Go behind the scenes of Iron Man 3, The Wolverine and Doctor Who! 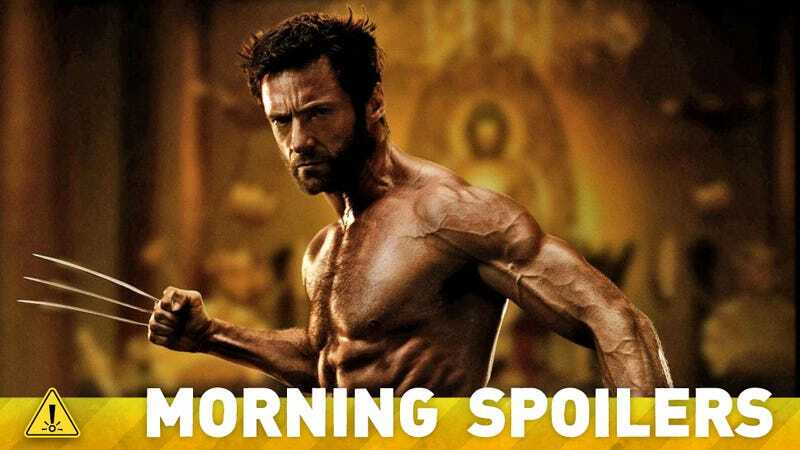 Check out a new interview with the cast of Iron Man 3 and a bunch of photos that take you behind the scenes of James Mangold and Hugh Jackman's The Wolverine. A studio executive explains why Moon director Duncan Jones's World of Warcraft movie could change video game adaptations forever. Plus a Defiance director reveals key details about Syfy's latest, and ABC's S.H.I.E.L.D. show adds a Joss Whedon alum in a mysterious role! Spoilers from here on out! Top image from The Wolverine. Here's a new behind-the-scenes video. You can check out another at the link. Bits and pieces, yeah. I don't want to give too much away, but it's going to be a frickin' awesome movie. It's really great! Is it more exciting or nerve-wracking to be a part of something that has become so highly anticipated? I think the nerve-wracking part of it comes from being really one of the only women in the movie. There's some other women in the movie, but they're in the very, very, very beginning. There's nobody to take focus off of me, if I'm not good. That was my biggest fear. There's so many guys in the movie. They were all amazing. Every single one of those guys are phenomenal actors, and they really brought such life to their characters. But, when you're the only woman in most of the movie, there's a lot of pressure. If you're not good, everyone is like, "Well, the girl sucked!" It's not like people can go, "Which one?" The flipside of that is, if it succeeds, it's the other side of that. This is, by far, the biggest movie I've ever done. I'm incredibly excited, but I'm also really scared. So, we'll see. 1. Casting. This is the most asked about issue by the fans. So here’s the deal! Casting for the remaining characters for the first film is officially underway once again. 2 Locations. The final locations for shooting are now being decided by our director Mark Waters. The big news is we will be shooting the movie in Europe, mostly in and around the UK, with additional photography planned in Montana. 3. Green light. The project was officially declared to proceed as of April 1. Our targeted (estimated) date to begin production is the last week in May. I think first of all is to lose the fact that it's a video game movie and just concentrate on do you have a story that's worth telling? Because if you look back to the 80's, comic book movies were not anywhere near what they are today. They weren't given the resources and you didn't have the level of directors that you have today working on these things. I think with video games it's just become much more sophisticated storytelling, hard to do a movie off of Pong, but today when you have stuff like Mass Effect, you have things like Warcraft, you have things like Skyrim where very cool worlds have been created, that's what we're attracted to. We took our time with Warcraft because just saying "How many people play the game? Well then that means X number of people will buy a ticket." That's a death trap, that's the surest way to make a crap movie, and that's not an option. So we took our time wanted to make sure that we used all the canon that's been built up over years and years by Blizzard. .. We're huge believers in Duncan Jones, and I think what we're going to bring to screen and to bear with Duncan, he is going to break that mold because it's going to have the resources, the talent around it, and a Field General in Duncan Jones. It's, again, the reason we took our time, made sure we had the right guy, the right person to make the movie, and then it will speak for itself when it comes out. "We're not kidding, we are actually going to do it, we're going to reveal his biggest secret." Smith: "It sort of does what it says on the tin, you won't be disappointed. I think it's hilarious, I think it's epic and I think it's fast and I'm telling you nothing more, but you will not be disappointed. I think it's going to be the biggest, best, most inventive and most exciting year for the show and I think this script delivers on all those points that you want it to for where the show is at this time, it's brilliant. Coleman: It pays homage to the last 50 years of the show and kind of really celebrates that, but at the same time as looking forward. FEELING LUCKY TONIGHT? - When Sam (Jared Padalecki) and Dean (Jensen Ackles) receive a distressing video message from Kevin Tran (guest star Osric Chau), they set about trying to uncover the Third Trial. The boys make a discovery that sends them to a casino in Colorado, to find a mysterious recluse (guest star Curtis Armstrong) who may be able to fill in the holes in Kevin's research. Meanwhile, Crowley (guest star Mark Sheppard) is on a winning streak. Castiel (Misha Collins) tries to elude Naomi (guest star Amanda Tapping) and the angels hunting him. WITH A LEAD ON WALTER'S WHEREABOUTS, OLIVER GAMBLES ON FELICITY IN THE FIELD - Finding it difficult to mend fences with Tommy (Colin Donnell) and Diggle (David Ramsey), Oliver (Stephen Amell) instead focuses on crossing another name off the list. While digging through a crooked accountant's laptop, Felicity (guest star Emily Bett Rickards) discovers a transaction that could help Oliver find Walter. To reconfirm the lead, Oliver gambles that Felicity can be counted on in the field for the first time. In a flashback, Malcolm (guest star John Barrowman) reveals to Robert Queen (guest star Jamey Sheridan) and Frank Chen (guest star Chin Han) painful details surrounding his wife's murder, and how that shaped his plans for the Glades. Meanwhile, Tommy (Colin Donnell) stuns Laurel (Katie Cassidy) with the truth. LET'S MAKE A DEAL - Damon (Ian Somerhalder) and Stefan (Paul Wesley) try a brutal new approach to provoke Elena (Nina Dobrev) into turning her humanity back on, and Caroline (Candice Accola) is frustrated when her attempt to intervene backfires. When Elena figures out a way to call the Salvatore brothers' bluff, they call for backup from a surprising source. Matt (Zach Roerig) gives Rebekah (Claire Holt) some unsolicited advice on her life choices, and she tries to help him in return. Caroline has a confusing and dangerous encounter with Klaus (Joseph Morgan), and Katherine (Nina Dobrev) is suspicious when Bonnie (Kat Graham) makes her an offer that she promises will benefit them both. And then we've got De-Tak-Tar trying to take over the town; he's the show's Tony Soprano. He's without boundaries. Then the whole idea that there are people trying to destroy the town - that kind of takes us through the whole series. In the UK, we had a series called Outcasts, which was kind of about people trying to survive as a community, and it didn't quite work. Do you think there's something about your country's history, which makes you better able to tell stories like this? Well, yes. One of our creative touchstones - what we kept telling ourselves - is that we're telling an immigrant story. The DNA of this country is different, in that we are all immigrants here, so the assimilation of the De Tak Tar family - their son is a rebel. He was born here, so he doesn't care about the customs of his ancestors. So you could essentially take the story and set it in New York in 1900. And also, the DNA of the show is very much a Western. Even though we made a creative choice not to have horses and cowboy hats, and not to make any nod to the Western, it really is. There's the sheriff and the doc and the prostitute in the saloon, so we have all the elements of a Western, but then we tried to move as far away from that as possible. The mythology, which you don't get the full extent of in the pilot, is that the six Votan races came to Earth don't get along. They're all from different planets, and ganged together because their sun was blowing up and they had to survive. But as soon as they got off the ship [on Earth], they went to war with each other. One race looks down on the other, one race was enslaved by another race, and so on. There's all kinds of unfinished business between them. Did you purposefully leave some of that backstory out of the pilot, to add an air of mystery? We actually shot something that explained everything for the pilot, where you basically got a history lesson. But it was dull, and we found that the desire from the audience to want to know more is very valuable. So yeah, we'll parcel it out as the show goes on. Also, it's not a very complex story, you really hear pretty much all of it by the time the pilot's over. CAT DISCOVERS HER MOM MIGHT STILL BE ALIVE - On the anniversary of her mother's death, Cat (Kristin Kreuk) asks Gabe (Sendhil Ramamurthy) to attend her family's annual remembrance of Vanessa, which makes Vincent (Jay Ryan) incredibly jealous. Cat learns some information that makes her think her mom might still be alive and when a sniper shoots the mayor at a public event, Vincent finds evidence that links Gabe to the sniper.